Beautiful junk ornaments of old era, various other types of small decorative items, trinkets, and antique pieces are some of the knick-knacks which are the main attraction of the local Bazaar of Nawalgarh. Most of these pieces are well worth their prices and serves as a perfect gift and well suited to your pocket. Another well known item of Nawalgarh which is found in plenty is the wooden furniture. The wooden furniture of Nawalgarh has a unique characteristic of Shekhawati era. Some of the most sought after wooden pieces here are chairs, stools, low tables, cradles, decorated chests and other craved furniture items. Apart from the wooden furniture the local bazaar also offers you to pep up your house furnishing with the antique fittings, which indeed is the appropriate way to give your home a classic look and feel. These are some of the most popular items of Nawalgarh market. Tie–and-die fabric is also quite in demand in beautiful and vibrant colors. Markets here are complete portrayal of the Nawalgarh art and living style. 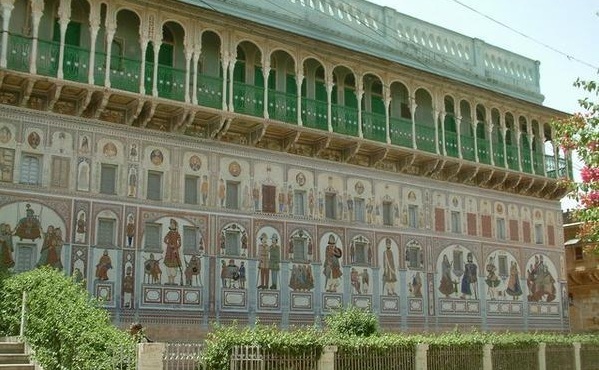 The rare replicas of frescos sold in these local markets, the beautifully carved furniture pieces or the junk antique items are synonym of Nawalgarh’s famous Shekhawati culture.